Transport of your car, classic vintage car, sports car, caravan, trike, quad, microcar, tractor, mobile canteen or boattrailer. We transport it with the greatest care and the best service at fair prices. Exclusive vehicle transportation by ambulance in the Netherlands, Belgium, Germany, France, England, but also the rest of Europe. Transport, at a competitive price and the best conditions. Request of tariffs is possible in advance. On each route, and every road, with our ambulancecar on the road, including assistance at a breakdown, defect or damage on the roadside. Towing when bad luck during holiday? We are your help in trouble. 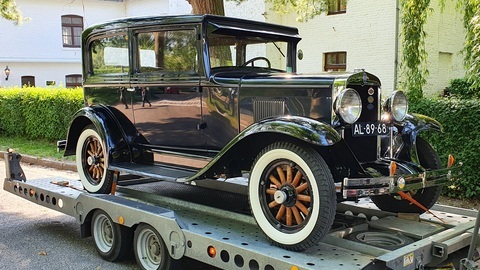 Cartransport, classics oldtimer, camper, tractor or transport of your boat on trailer. We are in possession of transport permits and handle a fair tariff. License, national and international is hereby required. We will keep you mobile!